21 of the best recent independent and foreign films will be offered and shown at multiple times over 3 weeks. Festival will run from Friday, April 13th through Thursday, May 3rd. Special Screening of Canaletto and the Art of Venice on Tuesday, April 24 at 2:00pm with speaker and Canaletto Scholar Jo-Ann Reif, from WVIA, who will share here extensive knowledge and appreciation of his art. All are invited to meet Jo-Ann Reif at this collaboration of the Dietrich Theater and WVIA. 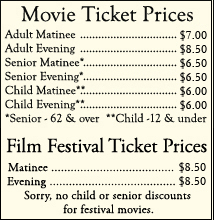 Tickets are regular movie price of $8.50 for this showing.